Product code: ES7770 Categories: Sold Items, Sold Jewellery. 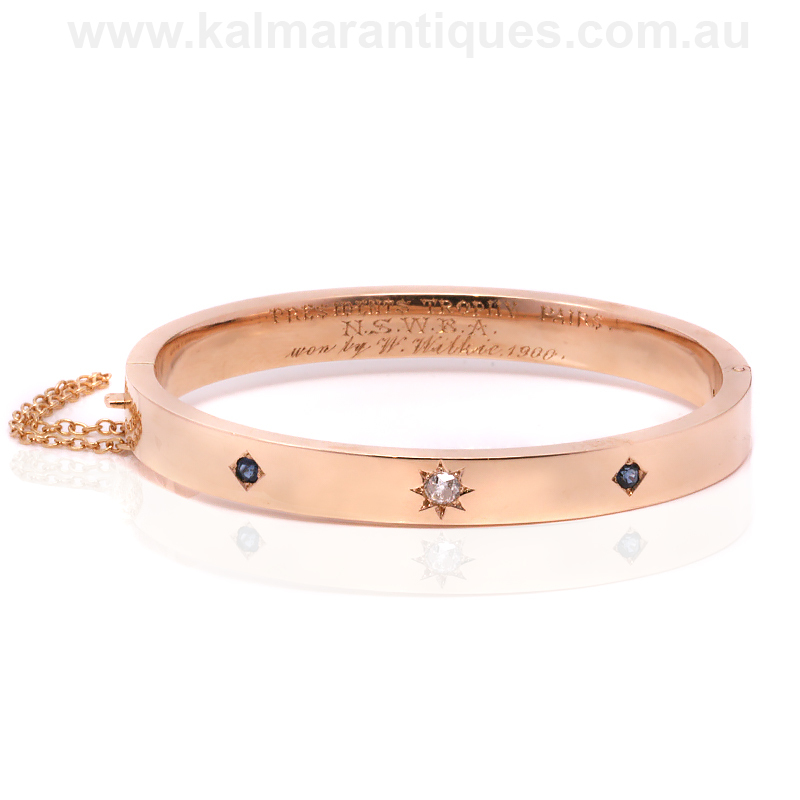 Here is a very beautiful 15ct gold antique sapphire and diamond bangle made in 1900 that not only has the beautiful warm rose gold colour, elegant sapphires and a diamond, but also a piece of Australian history. Presented in 1900 to W Wilkie, it is hand engraved on the inside back section “Presidents trophy pairs NSWBA won by W. Wilkie 1900“, this shows the provenance of the bangle. 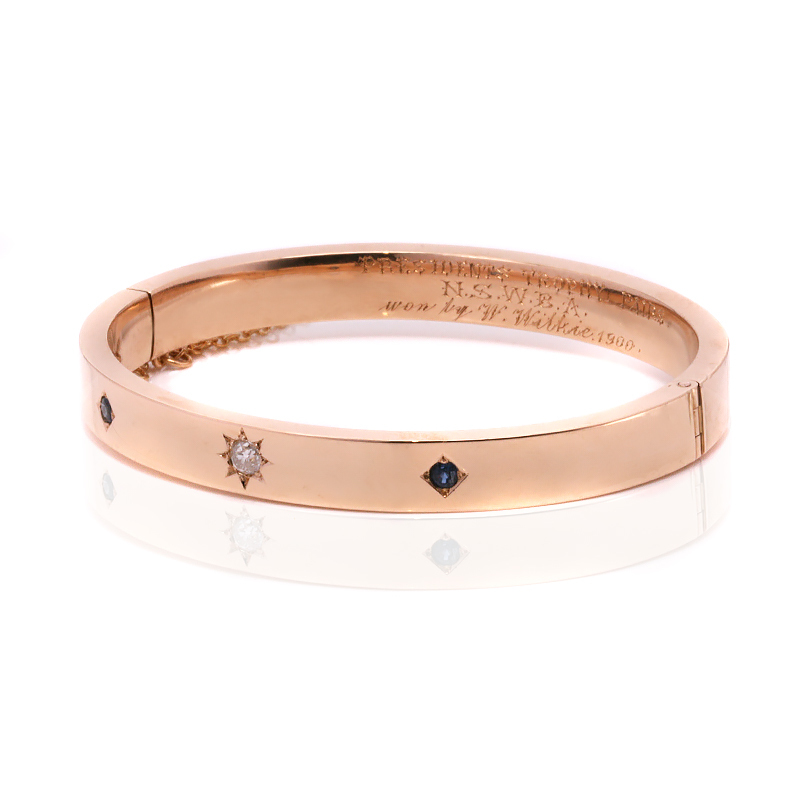 Measuring 7mm wide, the bangle is set with two sapphires that total 0.22 carats and one diamond that measures 0.20 carats, and not only are they set into the bangle, but they have the lovely star pattern around them often called a gypsy setting. Fitted with a safety chain for added security, this rose gold antique bangle is just perfect for anytime of the day or night. This antique bangle was won by W Wilkie in 1900. A member of the New South Wales Bowls Association. Made in 15ct gold, this antique bangle is set with two sapphires and a European cut diamond.